Happy New Year every one and I hope 2011 turns into a splendid year. May the future bring increased understanding of the surrounding world and good health to all. Today's fossil is the Agaricocrinus splendens crinoid. It was found in Montgomery County, Indiana. 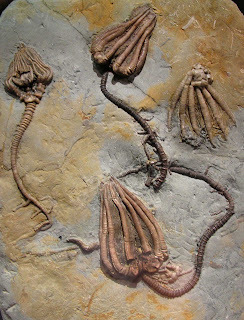 The creatures, whose fossilized remains are shown in the picture, lived in the Mississippian Period. As of 2010, this fossil plate was on display in Washington, D.C. at the Smithsonian National Museum of Natural History.